‘Sol i Norge!’ (Sun in Norway) That was the headline in the local newspaper three days ago. It is the best summer in 20 years. And we happened to pick the right time to drive from Oslo to the west of Norway to see the fjords. The weather was perfect. It was the best week-long road trip we’ve had. Day 1. Oslo – Lillehammer – Sel. We started driving from Oslo around 3 pm in the afternoon and stopped by Lillehammer (where the 1994 winter Olympics was held) for dinner. We proceeded to Sel, in the Otta kommune where we spent the night. There were lots of holiday makers who stayed there mainly for rafting in the Sjoa river. Day 2. 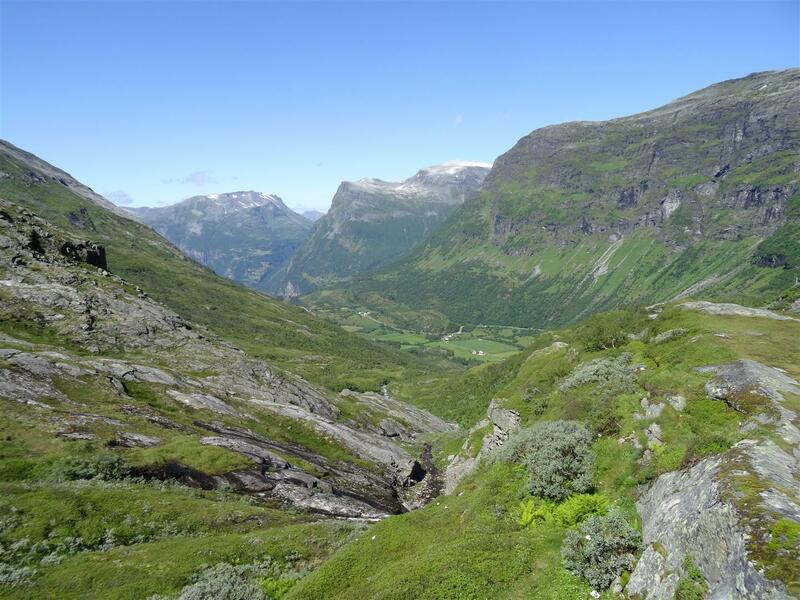 Sel – Geiranger – Hellesylt. 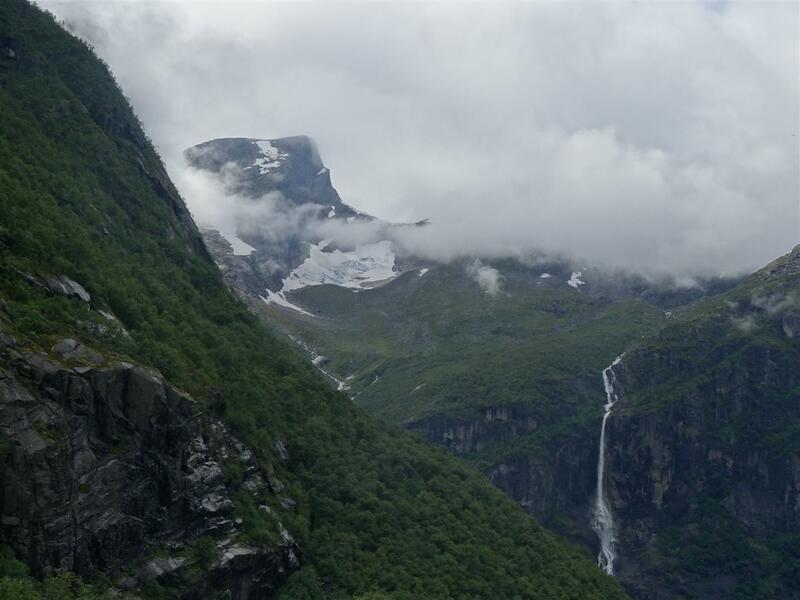 The next day, we continued on to Geiranger passing by Dønfoss campsite for lunch. 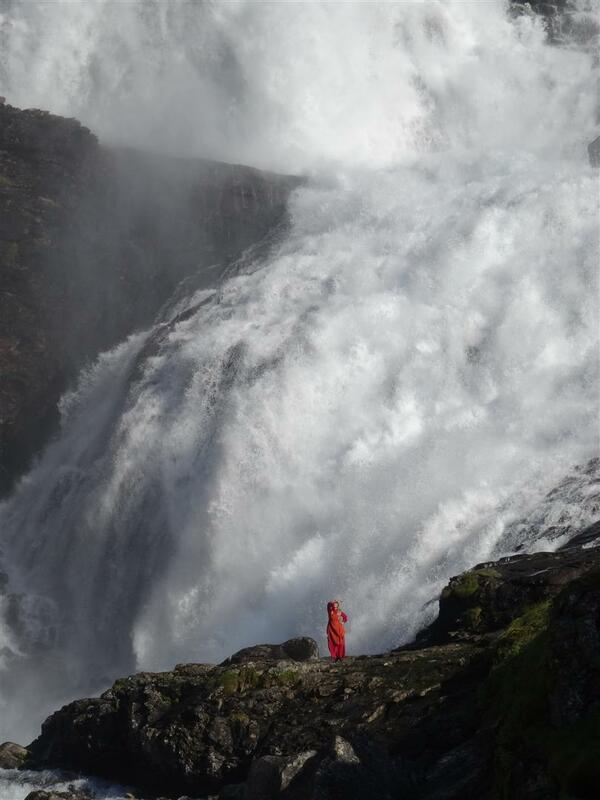 This campsite has a swimming pool beside the Dønfossen waterfall. It seemed to be a popular place for families with small children as it was packed when we stopped over. In the afternoon we navigated the mountain road towards Geiranger. The road was narrow and winding. Big tourist buses had difficulty maneuvering the roads. Geiranger fjord is breathtaking. 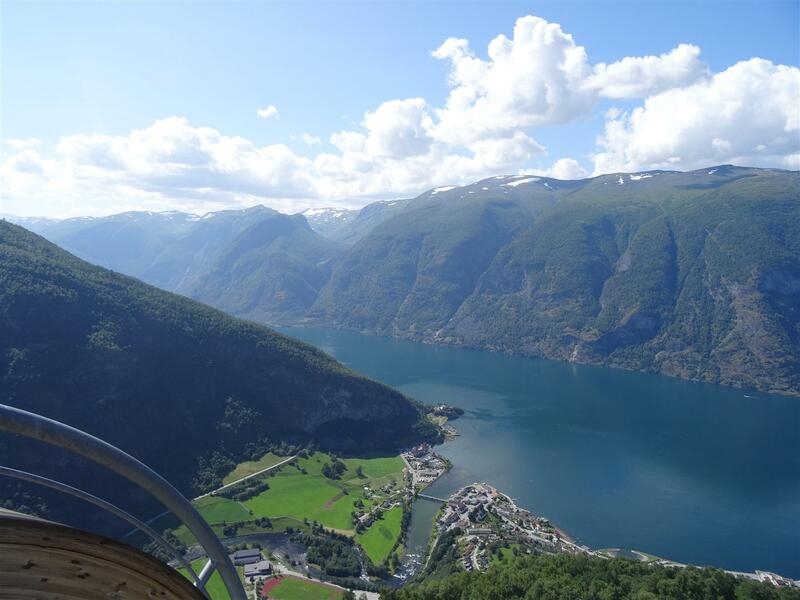 The view deck is high up in the mountain affording a panoramic view of the fjord. 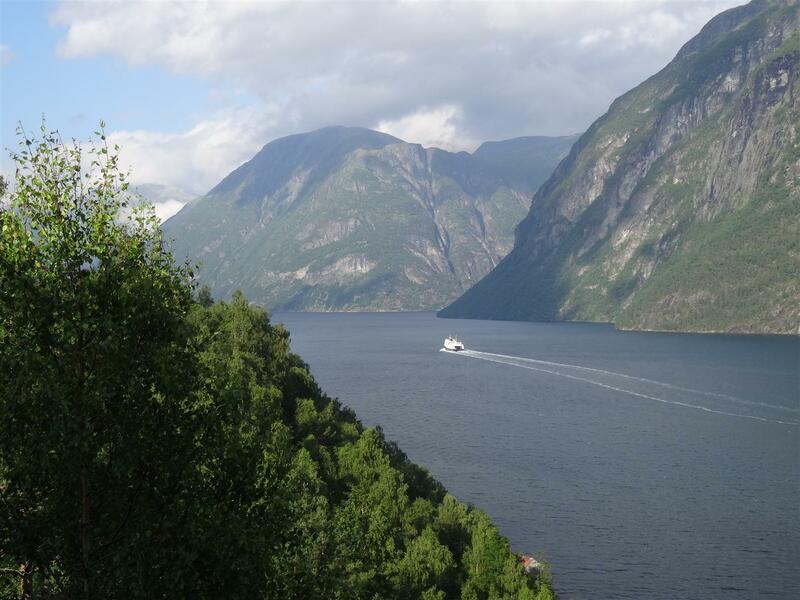 The fjord, carved by the glacier, is deep enough for huge cruise ships to enter it. The most dangerous part for the ships to navigate is not when it is inside the fjord but where the fjord empties into the sea as there could be shallow areas there. We loaded the car to the ferry crossing the fjord towards Hellesylt. 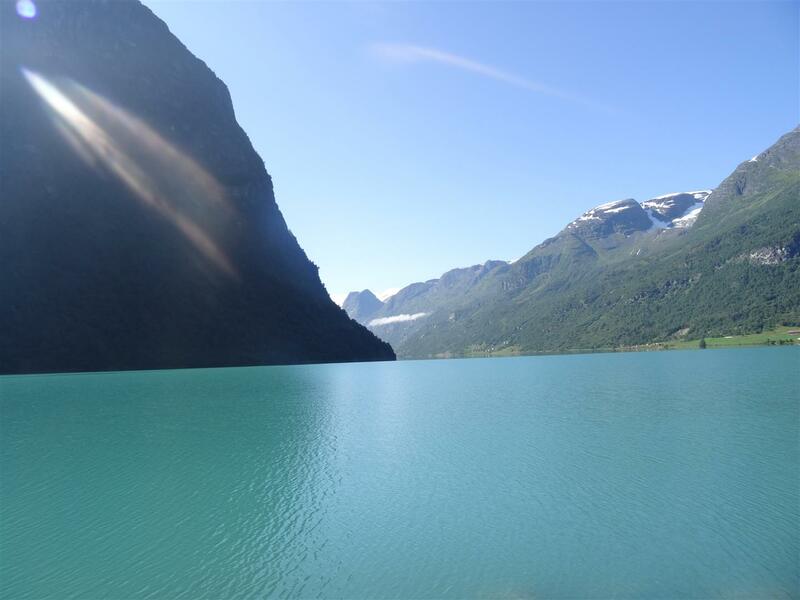 The ferry cruise in the Geiranger fjord is a must. 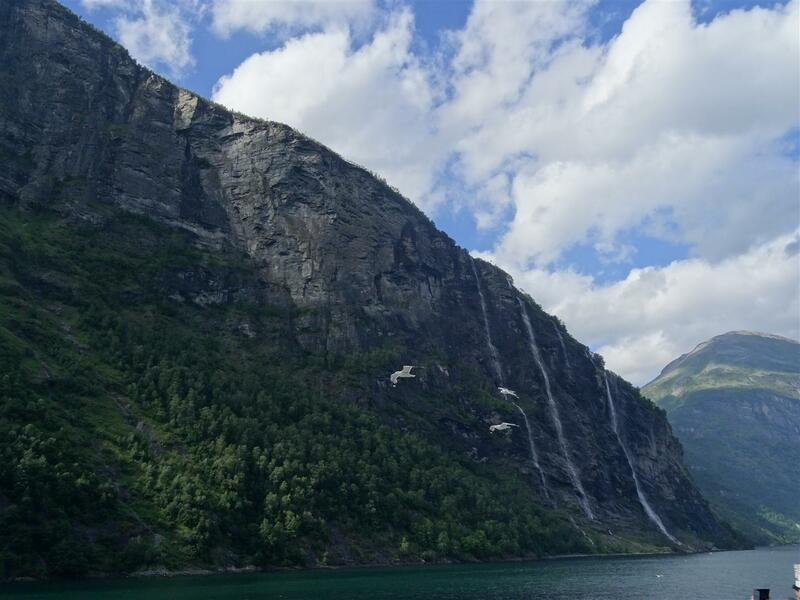 It is the best way to see the fjord, with the waterfalls along it up close. The sea gulls hovering around the ferry accompanied us in the one-hour crossing. Day 3. 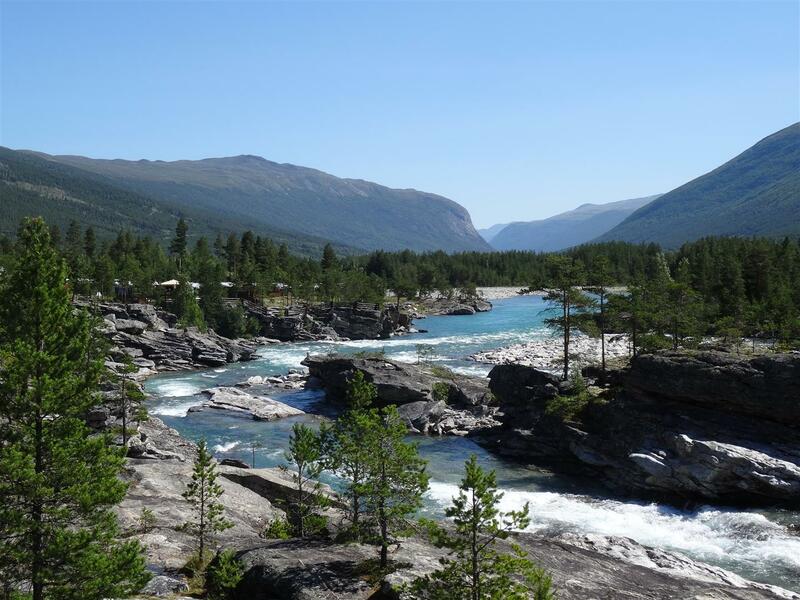 Hellesylt – Briksdal. In the third day, we continued driving towards Briksdal where one arm of the Jostedal glacier (the largest glacier in continental Europe) could be seen. The road going to Briksdal was even narrower. 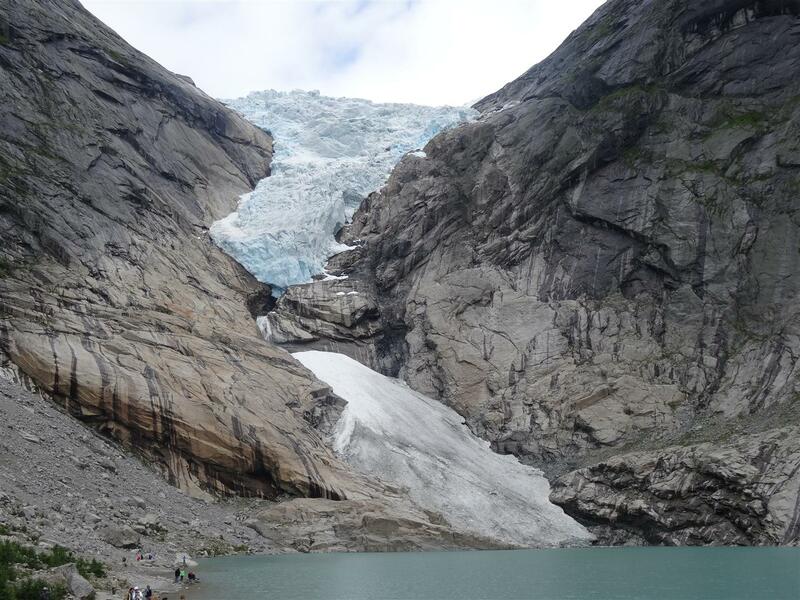 The glacier itself is around 45 minutes walk to the nearest hotel. There are however troll cars (like golf carts) taking tourists up and down the protected area where one could proceed on foot towards the glacier. The walk towards the glacier was an experience in itself. There was a waterfall spraying people along the way. There were also rocky parts where one could get up to for a better view of the area. There are markers along the way showing how far the glacier has shrank. And it shrank a lot, especially in the last decade. 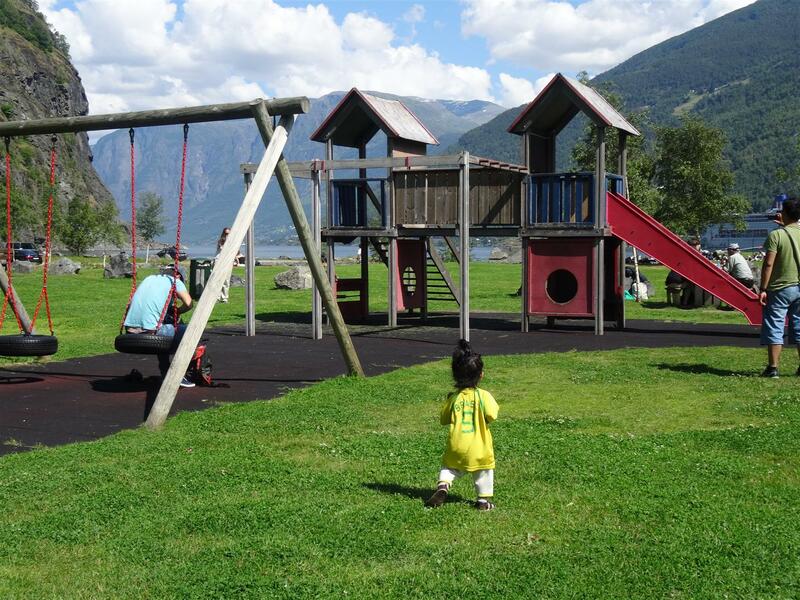 At the foot of the glacier, there is a sandy area where children could play. Although some areas were restricted for risk of falling rocks. The glacier itself takes center stage. Aside from the glacier, there were waterfalls to the left and opposite the glacier. The hotel’s restaurant where we stayed for the night has wide glass windows and glass ceilings for a very good view of the waterfalls. Day 4. Briksdal – Sogndal. 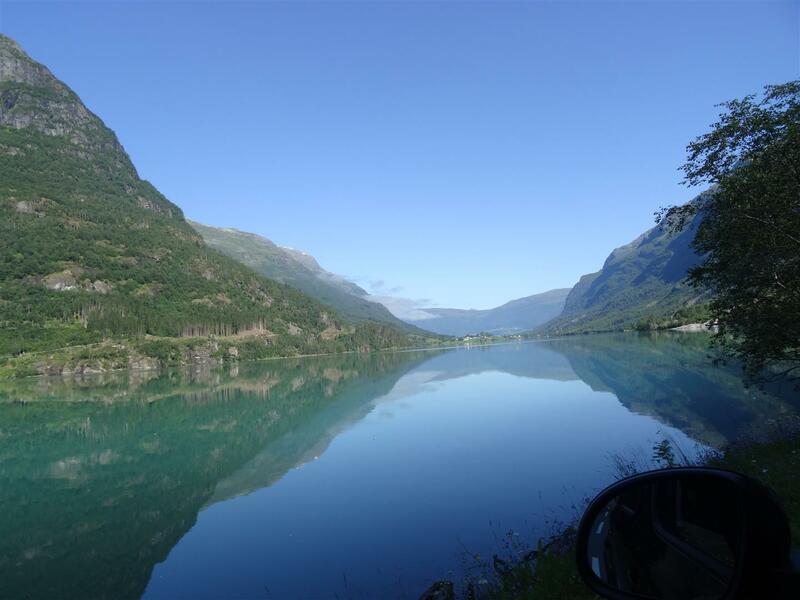 The next day we drove from Briksdal towards Sognefjord – the longest fjord in Norway. 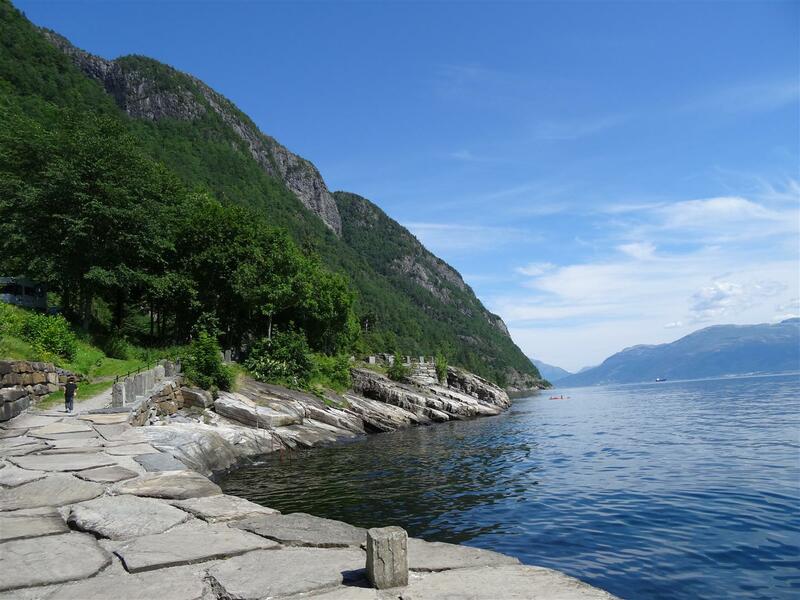 and in my opinion, the fjord with the stillest water in Norway. The waters mirror the mountains, cottages along the banks and even the clouds. 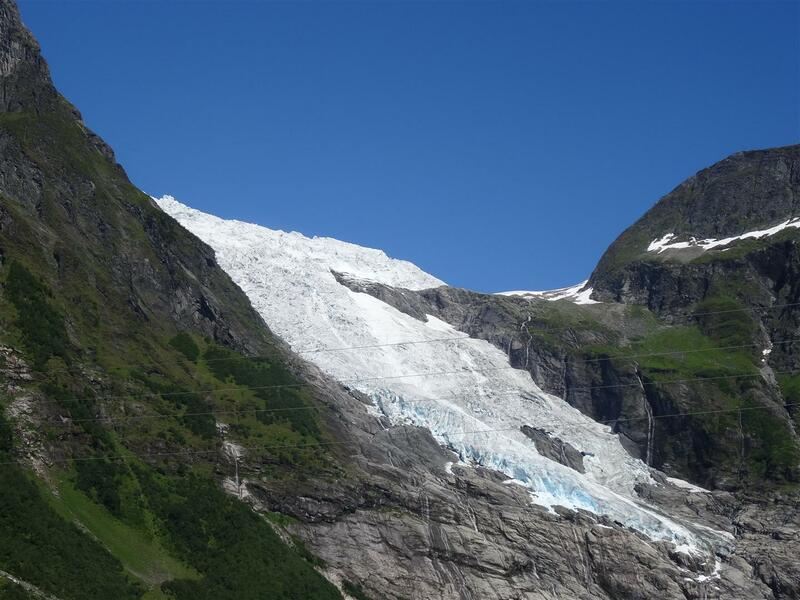 Along the way, another arm of the Jostedal glacier could be seen from the road. 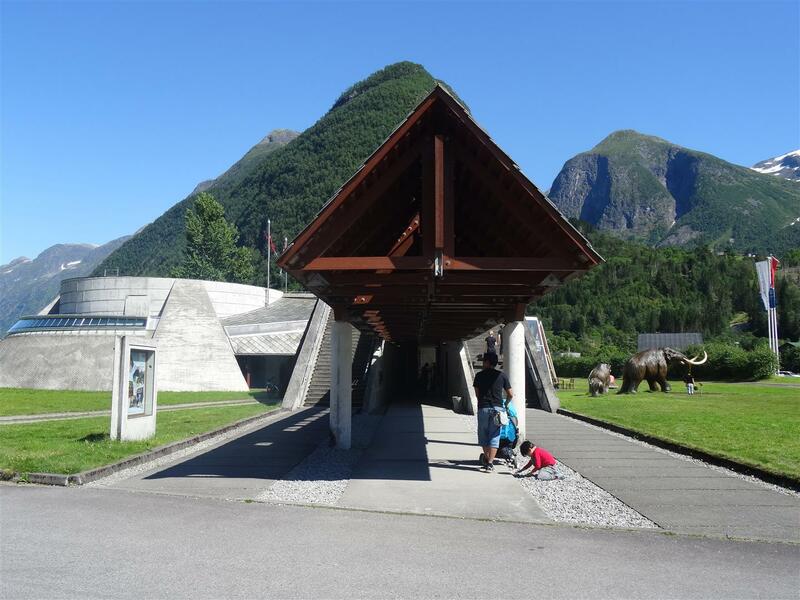 We also visited the glacier museum in Fjærland which gives an overview and a panoramic movie of the Jostedal glacier and its many tributaries (if you can call it that) and also of how the fjords are formed. 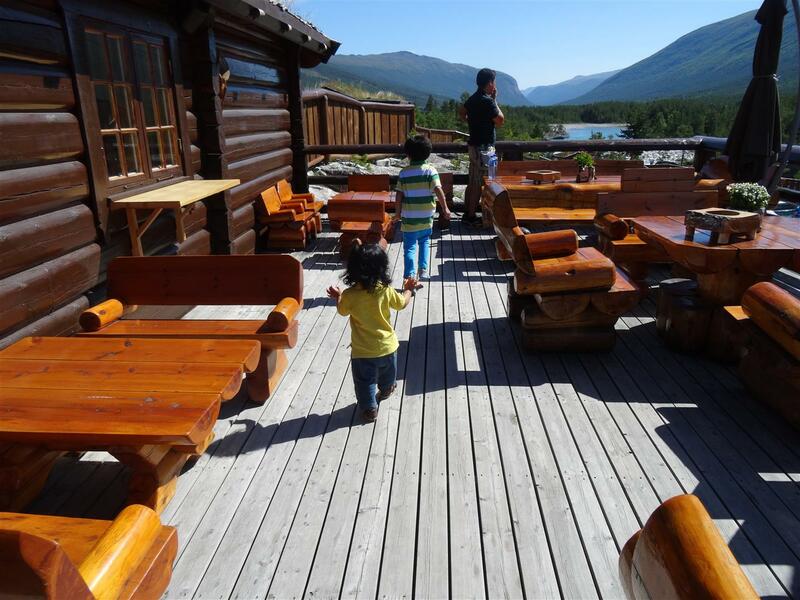 We stayed in Sogndal. Next to the hostel where we stayed, there is a barnehage with views of the fjord. Day 5. 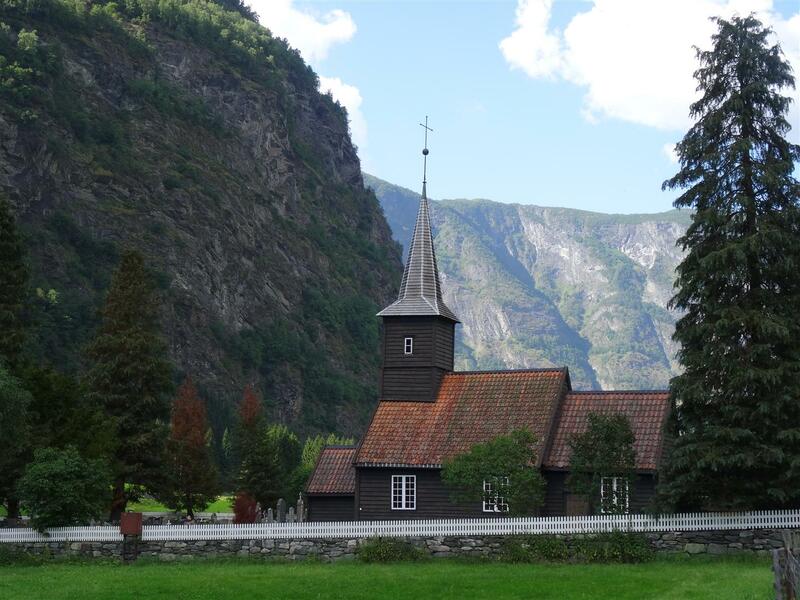 Sogndal – Aurland – Flåm. 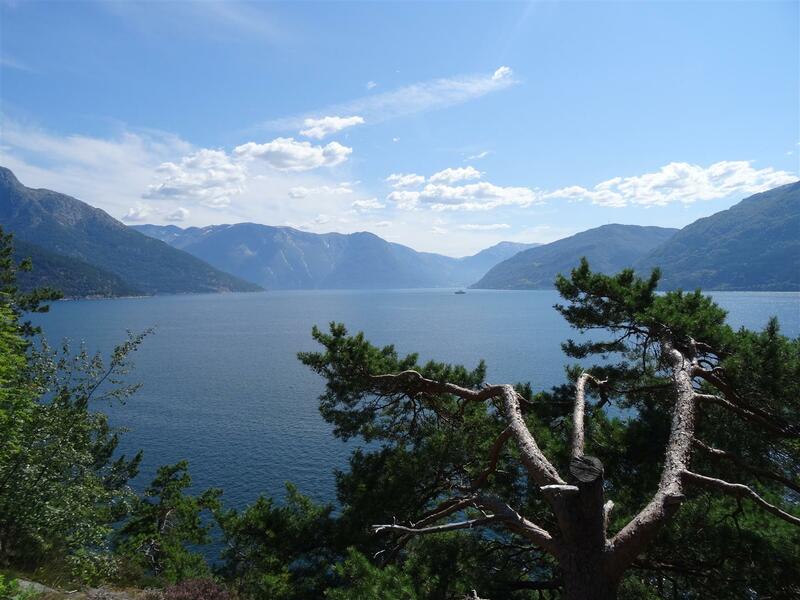 In the fifth day, we continued towards Aurland and drove towards the top of the mountain in Stegastein which has probably the best view of the Aurland fjord. The view deck itself has a contemporary and interesting design – like a giant slide. The edge has a transparent mirror. 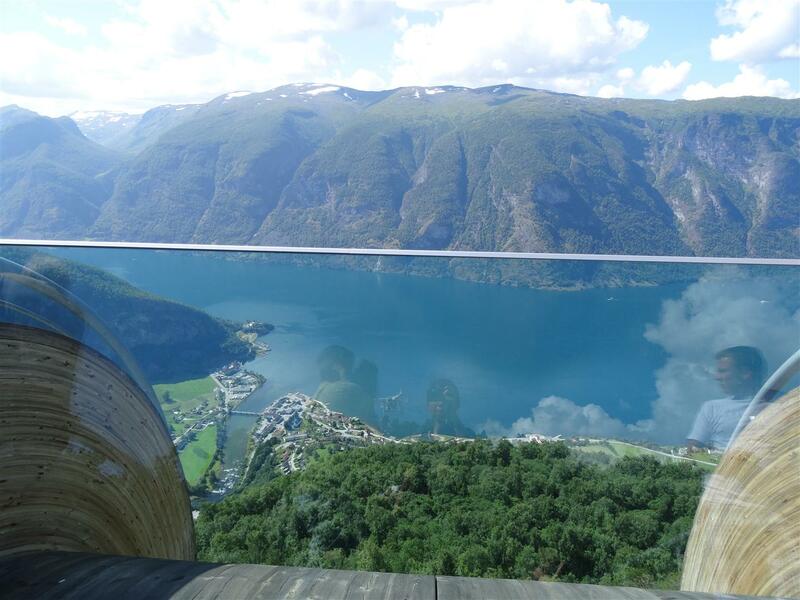 As if you could take a plunge down the fjord with one wrong step. Although I know that this has been designed to withstand people leaning against it. My brain still keeps on telling me not to hold on to the glass barrier and keep on reminding my son, not to get any closer to the edge. We continued driving towards Flåm where the narrowest fjord, Nærøyfjord, could be found. 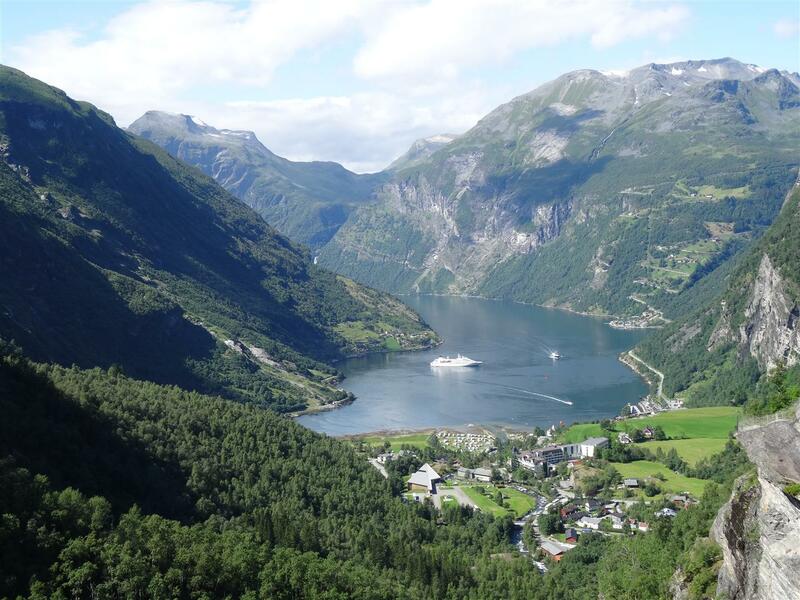 There were a couple of cruise ships docked at the fjord when we were there and a large number of tourists. We first took a small miniature train that went down to the village and gave an overview of the village life, how the people make their living, the important buildings and the waterfalls in the village. We then took the Flåm railway, which is the steepest rail in Norway, climbing towards Myrdal where a connection to the Bergen railway could be made. The Flåm railway is also reputed to be one of the most scenic railways in Europe. One way from Flåm to Myrdal takes about 45 minutes. Along the way, the train passed by a huge waterfall where a wood nymph is believed to appear and lure men into her forest lair. Along the way, one can see the best view of the village Flåm in the middle of the valley underneath the mountain going to Myrdal. Day 6. 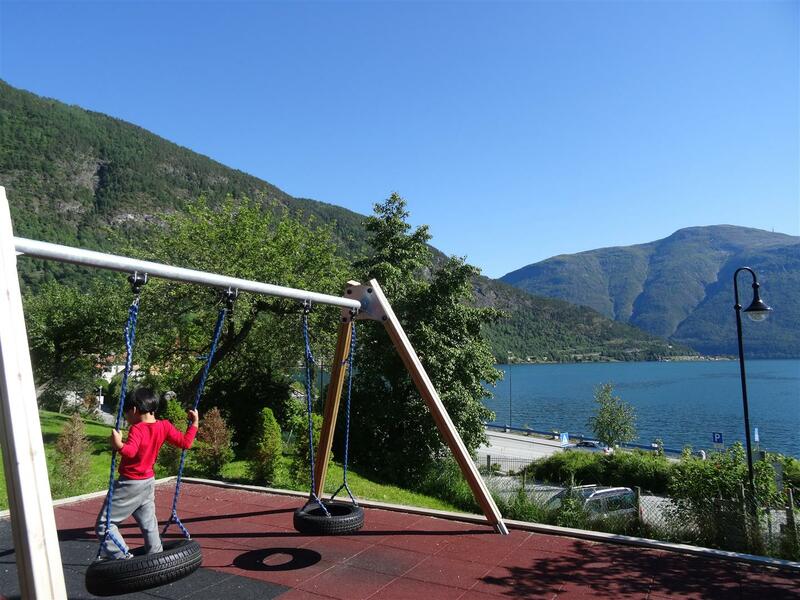 Aurland – Hardanger. 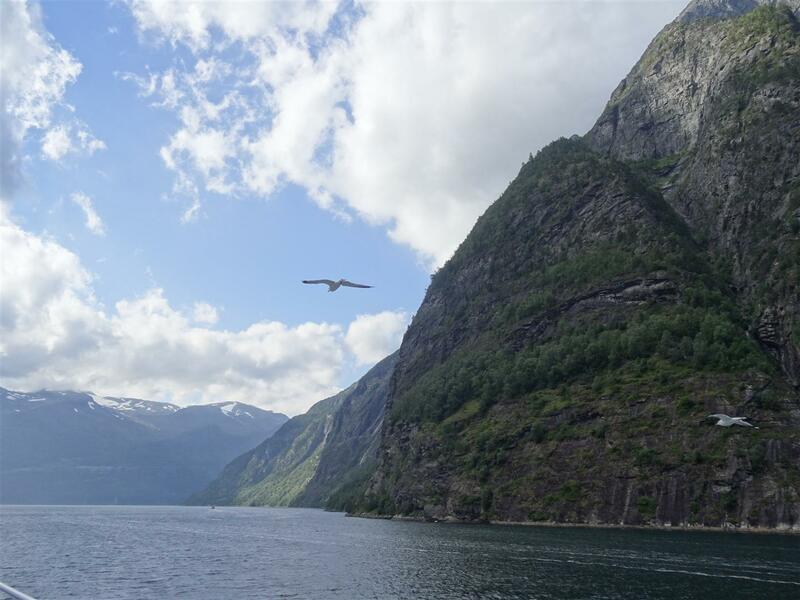 In the sixth day, we continued on to Hardanger fjord – the second largest fjord in Norway. 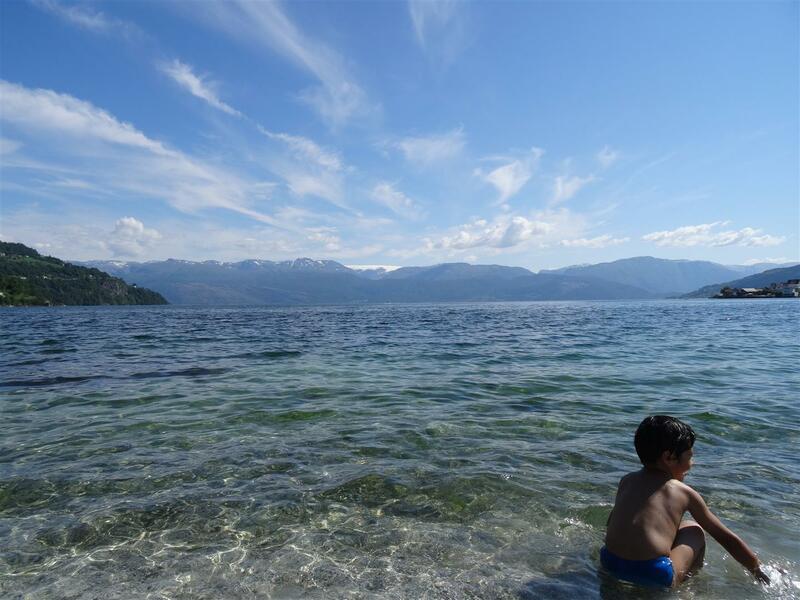 During this time, the surface water in the fjord has been warmed by the sun continuously for a week and is warm enough to swim into (although if you go deeper, it is still cold). So, Joel and my son bravely joined the locals for a dip. My son’s lips were quivering after a while but he still won’t get out of the water as kids do. This sealed the summer for us. Stunning scenery! You are so fortunate with the weather. We were lucky indeed. In my 7 years in Norway, I never thought we’d be able to swim in the fjords. It was that warm last week. Yes, I so yearn to do it! Bergen, the fjords, the North Cap and Hammersfest (in winter! ).